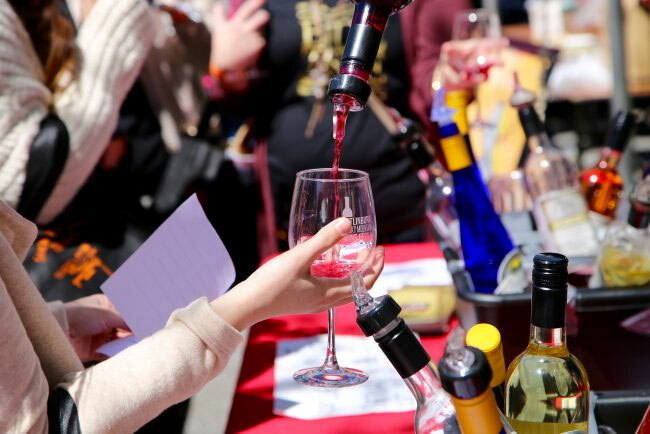 The annual Smoky Mountain Winefest happens Saturday afternoon between 1 and 6 pm on April 8, 2017 at the Arrowmont School of Arts and Crafts in Gatlinburg at 556 Parkway. At least 17 wineries from around Tennessee will be present offering samples and sales of their wares, along with expert guidance on wine and food, and the perfect food pairings from local restaurants. Come visit the sommeliers and chefs of Gatlinburg and Tennessee in this event endorsed by the Tennessee Wineries Association. Explore wines and foods for the tastes you may never have experienced before. Take home a wine glass imprinted with the festival, and maybe a bottle or case of the wines that captured you. The festival is also a great time to get familiar or renew acquaintance with the lovely Arrowmont campus, always a great place to withdraw from the bustle of Gatlinburg and immerse in fine arts and crafts. Any excuse to visit Arrowmont School of Arts and Crafts is worth taking, and this is one of the tastiest all year! Many seasonal varieties will appear at the Winefest, including the Arrowmont spring edition from Gatlinburg favorite Sugarland Cellars, available for purchase. It’s a blend of Tennessee Chardonnay, Chardonnel and Vidal Blanc, said to be perfect for the season, and if you’re an Arrowmont fan you’ll love the label artwork by Tennessee artist and Arrowmont instructor Lisa Line. Tickets are $30, available at the door. For more information see the Smoky Mountain Winefest event listing. See you at the tastings!